The great San Francisco singer Mary Stallings, an SFJAZZ mainstay dating back to the mid-1980s, when the organization was known as Jazz in the City, offered a different kind of benediction with a gracefully swinging run through “I Love Being Here with You” accompanied by Eric Reed and the SFJAZZ High School All-Stars. 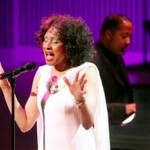 Mary Stallings sings “I Love Being Here With You,” during the opening night concert of the SFJAZZ Center Wednesday, Jan. 23, 2013 in San Francisco. … And even with all the world-renowned stars, this opening night had a hometown feel. Born just a few blocks, Mary Stallings — “the world’s greatest jazz singer,” Kline called her — sang Peggy Lee’s “I Love Being Here With You” with the SFJazz High School All-Stars. Old-school swing, nice and bluesy, it was followed by the modernist retro-isms of pianist Jason Moran (one of SFJazz’s five resident artistic directors) and drummer Eric Harland. The duo squeezed a Fats Waller tune (“Yacht Club Swing”) through the wringer; out the other side came stride piano, Bud Powell-ish “Un Poco Loco”-isms; Afro-jazz vamps and hip-hop. 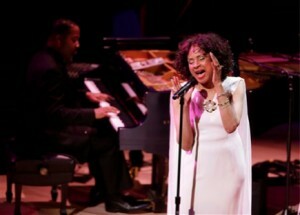 Stallings is a jazz vocalist in the classic tradition … she honestly seems to be at the peak of her considerable musical powers. … She didn’t do a lot of fancy tricks, but she imbued her repertoire with wisdom, a well of emotional depth and logic of the heart. She slowed the tempo way down for “I Don’t Stand a Ghost of a Chance With You,” buttressed by a beautiful bowed bass solo by Harvie S that enhanced the haunting mood. The ballad “Yesterdays” was at once wistful and bittersweet, with a very personal, lived-in quality beyond the reach of so many singers. Stallings warmth keens with blues inflections. Her firm sense of time and pulse reach you with laid-back ease. You won’t find her over-singing or trying hard to impress. Ms. Stallings’ love of her audience not only come through in her emotionally effusive singing, but in her visual presentation; She always looks like a Beverly Hills fashion plate. Mary Stallings an Elegant Singer with voice like a cello. A slender of soul — deep elegance an actor presence an adventurous spirit and an alto voice — a sense of swing so distinctive she owned each tune. Mary signing is no frills, just pure pleasure with sweet tone and a great sense of melody. We love Mary with spontaneity, mesmerizing our soul with grace and warmth. Mary Stallings hit all the right notes in her December 23 Prague debut at the National Theater. The American jazz virtuoso vocalist sang pitch-perfect classics from Cole Porter, Duke Ellington and others, including in her program Christmas favorites, tributes to the rich Czech musical heritage and to the great Czech leader Václav Havel.